NOTICE: Requires the base game Borderlands 2 in order to play. 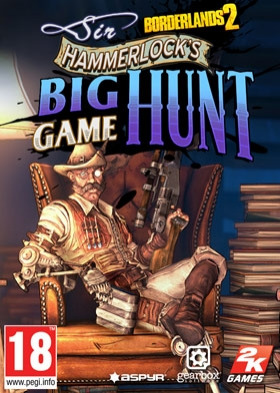 Activation key must be used on a valid Steam account, requires internet connection.ABOUT THE GAMEIn Sir Hammerlock’s Big Game Hunt, the third campaign add-on for Borderlands 2, players will enter an uncharted territory deep in the swamps of Pandora where a massive Hyperion ship has crashed. The wreckage is rumored to have stockpiles … of loot. But watch out, mutated creatures, and armies of savages also have an interest in the ship. As ferocious and primal as they may seem, the mysterious Professor Nakayama claims to be their diabolical leader, and he’s calling all the shots. KEY FEATURES	The Best guns in Borderlands 2 yet! This safari trip ain’t just ‘bout taking down big game with huge, senselessly overpowered weapons. It’s also about hunting for new loot in an effort to glean Seraph crystals, and get even bigger guns to take back into the main game. Defend Hammerlock’s Hacienda: Seek out Sir Hammerlock and his rustic hunting lodge, man the turrets and fan boats to take out enemy vehicles, babysit Hammerlock's pet Skag and wait for him to... ewwww. To Hunt and Be Hunted: Face a new Raid Boss, new World Bosses, mutant creatures great and greater, and waves of foul-odor-ed heathen hoards. In the swamp, no one can hear your smell. All New Swamp Location: Alien vegetation, marshy water, scraggly mountains, and rolling mist form a dangerous and exotic zone, all in an as-of-yet-unseen part of Pandora. New Swamp Vehicle: Head out in to the swamps on the new loaded Swamp Fan Boat to do battle against enemy vehicles and mutant big game – overalls and moonshine not included. New Heads & Skins: Spoils are awarded to those who seek out and defeat the rarest enemies in the Swamps. If it’s on the endangered species list; kill it immediately, because it’s all about you. SYSTEM REQUIREMENTS Minimum: OS: 10.7.5 (Lion), 10.8.2 (Mountain Lion) CPU Processor: Intel Core 2 Duo (Dual-Core) CPU Speed: 2.2GHz RAM: 4 GB RAM HDD: 13 GB GPU (ATI): Radeon HD 2600 GPU (NVidia): Geforce 8800 VRam: 256 MB Peripherals: Macintosh mouse and keyboardSupported Video Cards: NVIDIA GeForce® 8800, GT 120, 320M, 330M, 650M ATI Radeon HD 2600, HD 3870, HD 4670, HD 4850, HD 5670, HD 5750, HD 5770, HD 5870, HD 6630, HD 6490, HD 6750, HD 6770, HD 6970 Intel HD Graphics 3000, 4000Gamepad support: Borderlands 2 supports the Xbox 360 wired gamepad only. Other Requirements: Borderlands 2 is required to play this add-on contentOther Requirements: Initial installation requires one-time Internet connection for Steam authentication; software installations required (included with the game) include Steam Client. Internet Connection and acceptance of Steam™ Subscriber Agreement required for activation. See www.steampowered.com/agreement for details Recommended: CPU Processor: Intel Quad Core CPU Speed: 2.4 GHz RAM: 4 GB RAM VRam: 512MBNOTICE: The following video chipsets are unsupported for Borderlands 2: ATI RADEON HD 2400 NVIDIA 8600m NVIDIA 9400m, 9600m Intel Integrated GMA 950 Intel Integrated x3100NOTICE: This game is not supported on volumes formatted as Mac OS Extended (Case Sensitive)	Unauthorized copying, reverse engineering, transmission, public performance, rental, pay for play, or circumvention of copy protection is strictly prohibited © 2013 Gearbox Software, LLC. Published and distributed by 2K Games. Gearbox Software, Borderlands, and the Gearbox and Borderlands logos are trademarks of Gearbox Software, LLC. 2K Games and the 2K Games logo are trademarks of 2K Games in the US and/or other countries. Unreal, the circle-U logo and the Powered by Unreal Technology logo are trademarks or registered trademarks of Epic Games, Inc. in the United States and elsewhere. Uses Bink Video. Copyright © 1997-2013 by RAD Game Tools, Inc. This software product includes Autodesk® Scaleform® software, © 2013 Autodesk, Inc. Autodesk and Scaleform are registered trademarks or trademarks of Autodesk, Inc., and/or its subsidiaries and/or affiliates in the USA and/or other countries. Powered by Wwise © 2006 - 2013 Audiokinetic Inc. © 2013 NVIDIA Corporation. NVIDIA, the NVIDIA logo, GeForce, PhysX, The way it’s meant to be played, and 3D Vision are trademarks and/or registered trademarks of NVIDIA Corporation. Published and distributed by Aspyr Media, Inc. “Aspyr” and the Aspyr “star” logo are federally registered trademarks of Aspyr Media, Inc. Mac and the Mac logo are trademarks of Apple Computer, Inc., registered in the U.S. and other countries. The ratings icon is a trademark of the Entertainment Software Association. All other marks and trademarks are the property of their respective owners. Non-transferable access to special features such as exclusive, unlockable, downloadable or online content, services, or functions may require single-use serial code, additional fee and/or online account registration (17+). Access to special features may require internet connection, may not be available to all users, and may, upon 30 days notice, be terminated, modified or offered under different terms. ne play and download requires broadband internet service. User responsible for associated fees. All rights reserved.